For other people named William Parry, see William Parry (disambiguation). Rear-Admiral Sir William Edward Parry FRS (19 December 1790 – 8 July 1855) was an English explorer of the Arctic who was known for his 1819 expedition through the Parry Channel, probably the most successful in the long quest for the Northwest Passage. In 1827 he attempted one of the earliest expeditions to the North Pole. He reached 82°45′N, setting the record for human exploration Farthest North that stood for nearly five decades before being surpassed at 83°20′N by Sir Albert Hastings Markham in 1875. Parry was born in Bath, Somerset, the son of Caleb Hillier Parry and Sarah Rigby. He was educated at King Edward's School. At the age of thirteen he joined the flagship of Admiral Sir William Cornwallis in the Channel fleet as a first-class volunteer, in 1806 became a midshipman, and in 1810 received promotion to the rank of lieutenant in the frigate Alexander, which spent the next three years in the protection of the Spitsbergen whale fishery. He took advantage of this opportunity for the study and practice of astronomical observations in northern latitudes, and afterwards published the results of his studies in a small volume on Nautical Astronomy by Night. From 1813 to 1817 he served on the North American station. Parry Channel runs west from Lancaster Sound. Melville Island is the westernmost yellow Island on the north side. 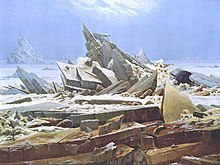 "Das Eismeer" (The Sea of Ice) by Caspar David Friedrich, 1823–4, was inspired by Parry's account from the 1819–1820 expedition. The harsh nature and radical composition, however, caused it to remain unsold until the death of the artist in 1840. "The Crews of H.M.S. Hecla & Griper Cutting Into Winter Harbour, Sept. 26th, 1819". An engraving from the journal published in 1821. In 1818 he received command of the brig Alexander in the Arctic expedition under Captain John Ross. This expedition followed the coast of Baffin Bay without making any new discoveries. Parry and many others thought that Ross was wrong to turn back after entering Lancaster Sound at the north end of Baffin Island. Partly as a result Parry was given command of a new expedition in HMS Hecla accompanied by the slower HMS Griper under Matthew Liddon. Others on the expedition were Edward Sabine, science officer and Frederick William Beechy. For protection from ice the ships were clad with 3-inch (7.6 cm) oak, had iron plates on their bows and internal cross-beams. They also carried food in tin cans, an invention so new that there were as yet no can openers. Instead of taking Ross's easy route anti-clockwise around Baffin Bay he headed straight for Lancaster Sound. Fighting his way through ice he reached clear water on 28 July and headed for Lancaster Sound. He passed Ross's farthest west and kept going. Blocked by heavy ice, they went south for more than 100 miles (160 km) into Prince Regent Inlet before turning back. Continuing west they passed 110° W (about 600 miles (970 km) west of Lancaster Strait) which entitled them to a £5,000 award offered by Parliament. Finally blocked by ice they turned back to a place Parry called Winter Harbour on the south shore of Melville Island, somewhere near 107- or 108° W. Cutting their way through new ice the ships reached anchorage on 26 September. Here they were frozen in for the next 10 months. There were three months of total darkness and in the new year the temperature reached −54 °F (−48 °C). The men were kept busy with regular exercise while the officers put on plays and produced a newspaper. The first case of scurvy was reported in January and by March fourteen men were on the sick list, about half with mild scurvy. Parry carried mustard and cress seeds and planted them in his cabin. The leaves seemed to help. There was some excitement in early March when the first melt water appeared, but by the end of the month the ice was still 6 feet (2 m) thick. In June Parry led a group of men dragging a wooden cart to the north shore of the island which he named Hecla and Griper Bay. It was the first of August before the ships were able to float out of the harbor. They got as far west as 113°46'W before turning back. It was too late in the season and new ice was already beginning to form. They reached England in October 1820 having lost only one man. Parry's voyage, which had taken him through the Parry Channel three quarters of the way across the Canadian Arctic Archipelago was probably the single most productive voyage in the quest for the Northwest Passage. Luck had been on their side; 1819 was unusually ice-free and no ship was able to travel so far west until Edward Belcher's expedition in 1850. A narrative of the expedition, entitled Journal of a Voyage to discover a North-west Passage, appeared in 1821, publisher John Murray paying 1,000 guineas for it. Upon his return Lieutenant Parry received promotion to the rank of commander. He was elected a Fellow of the Royal Society in February 1821. In April 1821 he again left for the Arctic commanding HMS Fury accompanied by HMS Hecla under George Francis Lyon. Others with him were George Fisher, scientist and chaplain, William Hooper, purser and diarist, lieutenants Francis Crozier and Henry Parkyns Hoppner and James Clark Ross, then a midshipman. Experience from the previous voyage led to improvements. The two vessels were nearly identical since Gripper had not been able to keep up with Hecla. They had cork insulation, cork plugs for the portholes and a coal-burning stove in the lowest deck to deal with condensation. The men were issued better clothing and lemon juice was stored in kegs rather than glass bottles. The goal this time was to find a passage near the northwest end of Hudson Bay. After working slowly through the ice of Hudson Strait he headed directly west to Frozen Strait which Christopher Middleton had found impassable in 1742. He passed Frozen Strait in a fog and found himself in Repulse Bay which he re-checked and found land-locked. He then ran northeast and mapped the coast of the Melville Peninsula and wintered at the southeast corner of Winter Island. From the Inuit he learned that northward the coast turned west. In March and May Lyon led two sledging expeditions into the interior. Freed from the ice in July he then went north and found the Fury and Hecla Strait, which was ice-filled. They waited for the ice to clear, but it did not. In September Lieutenant Ried trekked 100 miles (160 km) west along the Strait to the ice-filled Gulf of Boothia, the north end of which Parry had approached in 1819. When new ice began to form they went a short distance southeast and wintered at Igloolik. The ship was not freed from ice until 8 August. Since it was late in the season and there were signs of scurvy, he turned for home and reached the Shetlands in mid-October 1823. During his absence, he had been promoted to post rank in November 1821, and shortly after his return he was appointed acting Hydrographer of the Navy. His Journal of a Second Voyage, &c., appeared in 1824. In May 1824 he left London in the Hecla accompanied by Henry Parkyns Hoppner in the Fury. With them were Horatio Thomas Austin, James Clark Ross, and William Hooper, purser and diarist. The goal this time was Prince Regent Inlet at the west end of Baffin Island where he had been blocked by ice in 1819. 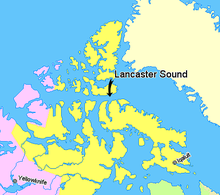 It was a bad year for ice and he did not reach Lancaster Sound until 10 September. He entered Prince Regent Inlet but after 60 miles (97 km) of ice he was forced to winter at a place he called Port Bowen on the eastern shore. In late-July 1825 they freed themselves from ice but 60 miles (97 km) further south they were caught by wind and ice and the Fury was driven against the western shore. After 48 hours work on the pumps it was deliberately beached. Stores were unloaded in the hope of careening the vessel, but by 25 August it was clear that the keel was broken. Most of the stores were left on the beach and the crew taken on board the Hecla which reached England in October 1825. Parry thought he could see open water south of the wreck site. He published an account of this voyage in 1826. The wreck site, Fury Beach, near 72°30′N 92°30′W﻿ / ﻿72.500°N 92.500°W﻿ / 72.500; -92.500﻿ (Fury Beach) where the coast turns west became an important landmark. Sir John Ross reached it in 1829. He found the hulk gone and many stores, Fury's boats and anchors piled on the beach. When his ship was frozen in further south he depended on those stores before being rescued. In 1850, Charles Codrington Forsyth reached it but was blocked by ice. In the following year Parry obtained the sanction of the Admiralty for an attempt on the North Pole from the northern shores of Spitsbergen at Sjuøyane. On 23 October 1826, Parry married Isabella Louisa Stanley, daughter of John Stanley, 1st Baron Stanley of Alderley, before undertaking the expedition. In 1827, he reached 82°45′N, which remained the highest latitude attained for the next 49 years. He published an account of this journey under the title of Narrative of the Attempt to reach the North Pole, &c.. In April 1829 he was knighted. Parry served as Commissioner of the Australian Agricultural Company based at Tahlee on the northern shore of Port Stephens, New South Wales, from 1829 to 1834. Parry was subsequently selected for the post of comptroller of the newly created department of steam machinery of the Navy, and held this office until his retirement from active service in 1846, when he was appointed captain-superintendent of Haslar Hospital. He reorganised the packet service, which had been transferred from the Post Office to the Admiralty in January 1837. Steamship companies were contracted to carry the mail, instead of naval vessels, on a regular schedule. He attained the rank of rear-admiral in 1852, and in the following year became a governor of Greenwich Hospital, and retained this post until his death. He died at Ems in Germany on 8 July 1855, but his body was returned to London for burial. He is buried in Greenwich Hospital Cemetery. The cemetery is now largely cleared to create a pocket park but he is named on the west face of the Officers Monument in the centre of the area. Sir William Parry's character was influenced by his unwavering belief in Jesus Christ, and besides the journals of his different voyages he also wrote a Lecture to Seamen, and Thoughts on the Parental Character of God. He was noted as "an evangelical [Christian] and an ardent advocate of moral reform in the navy." Parry also pioneered the use of canning techniques for food preservation on his Arctic voyages. However, his techniques were not infallible: in 1939 viable spores of certain heat-resistant bacteria were found in canned roast veal that had travelled with Parry to the Arctic Circle in 1824. The crater Parry on the Moon was named after him, as were Parry County, New South Wales, Parry Sound, Ontario, and the optical phenomenon Parry arc, documented by him during the 1819–1821 expedition. In 1930, a large sandstone rock at Winter Harbour on Melville Island marking Parry's 1819 wintering site, approximately 5.5-metre-long (18 ft) and 3-metre-high (9.8 ft), was designated a National Historic Site of Canada. The standard author abbreviation W.Parry is used to indicate this person as the author when citing a botanical name. ^ Parry's Rock Wintering Site. Canadian Register of Historic Places. Retrieved 22 October 2013. ^ "Review of Journal of a Second Voyage for the Discovery of a North-West Passage from the Atlantic to the Pacific; performed in the Years 1821–22–23, in His Majesty's Ships Fury and Hecla, under the Orders of Captain W. E. Parry. 1824". The Quarterly Review. 30: 231–272. October 1823. "Lists of Royal Society Fellows 1660–2007" (PDF). London: The Royal Society. p. 273. Retrieved 21 November 2010. "Author details for Parry, William Edward". Index of Botanists. Harvard University Herbarium. Retrieved 1 February 2013. Berton, Pierre (1988). The Arctic Grail: The Quest for the North West Passage and the North Pole, 1818–1909 (1 ed.). Toronto: Random House of Canada. p. 100. ISBN 1-58574-116-7. Miller, Amy (2007). Dressed to Kill: British Naval Uniform, Masculinity and Contemporary Fashions 1748–1857. National Maritime Museum. p. 76. Parry, Rev. Edward (son of Sir William Parry) (1857) . Memoirs of Rear-Admiral Sir W. E. Parry (3 ed.). London: Longman, Brown, Green, and Longmans. "Fredreich, Caspar David". Web Gallery of Art. Retrieved 23 April 2007. Laughton, J. K. (2004). "Parry, Sir (William) Edward (1790–1855), Rev. A. K. Parry". Oxford Dictionary of National Biography (online 2006 ed.). Oxford University Press. doi:10.1093/ref:odnb/21443. Retrieved 31 October 2007. This article incorporates text from a publication now in the public domain: Chisholm, Hugh, ed. (1911). "Parry, Sir William Edward" . Encyclopædia Britannica. 20 (11th ed.). Cambridge University Press. Wikisource has the text of the 1885–1900 Dictionary of National Biography's article about Parry, William Edward.